Spain’s first national park was established in 1918 and owes its unusual name to those sea-faring discoverers of the Americas – who used the mountain peaks of the park as a landmark for not just Northern Spain but all of Europe. It’s a hugely popular resource all year round and you will just as easily find us there hiking in July as you will in January with a pair of snow-shoes on. Our tips? For a great family day out, pack a picnic and take the cable-car from Fuente De up to the top and walk back down through the pastures to Espinama where you can cool off with a refreshing beer (and soda for the kids). If you prefer a circular hike the route at Brez is very charming but requires a little more stamina. Stay at one of the 20 villages inside the park – and did you know that 1,157 people reside inside the park? The park’s wildlife is amazing and includes wild boars, wolves, roebuck and wild brown bears plus 100 species of birds including the griffon vulture and the golden eagle. Living here in wintertime is not for the faint-hearted – click here if you want to see us get to grips with the snow-shoes in the Picos. and click here if you’d like to read our guide to Northern Spain or learn more about Cantabria and Asturias. 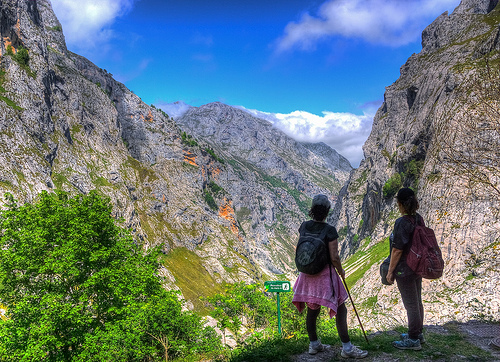 Famous for its four glacial canyons, see here, this park is Spain’s second oldest awarded national park status in 1918 (just 25 days after the Picos de Europa was named the first). El Pais describes the 156 square km expanse as “a landscape of contrasts – its high ground is arid and snowy, while below in the valleys there are forests, meadows, waterfalls and gullies. The park is dominated by the Monte Perdido massif at 3,355m and its three sisters peaks. 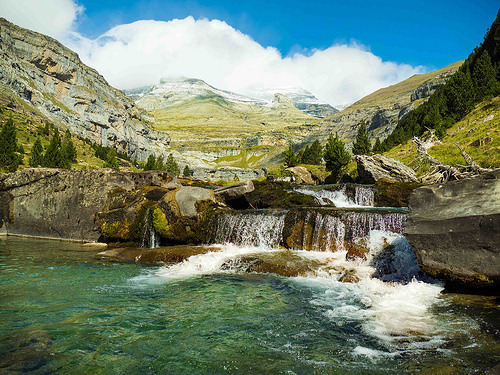 The Guardian says this park which nudges the French border offers hikes for all abilities, including paths along natural ledges in the limestone just a metre wide adding that the popular hikes begin at Pradera de Ordesa including the Circo de Cotatuero, a six-hour circuit to a thundering waterfall. Keep an eye out for the Pyrenean chamois (a type of antelope), the marmot, boar and the Pyrenean water-mole and birds such as the golden eagle, the bearded vulture, the griffon vulture, hawks, and the royal owl. It’s possible to raft through the rapids inside the park too if you are feeling extra adventurous. After the exertions, you can retire to Bielsa Parador restaurant and enjoy the wonderful views from the base of Monte Perdido. Dating from 1955, the name Aigüestortes – meaning twisting or winding streams – is Catalonia’s only national park and is a wonderful amenity for walkers, hikers and photographers. It’s also pretty popular for wildlife – including the golden eagle, capercaillie and the bearded vulture. You’ll also find the Pyrenean chamois, and with so much water – grass frogs, toads, Pyrenean newts, muskrats and otters. 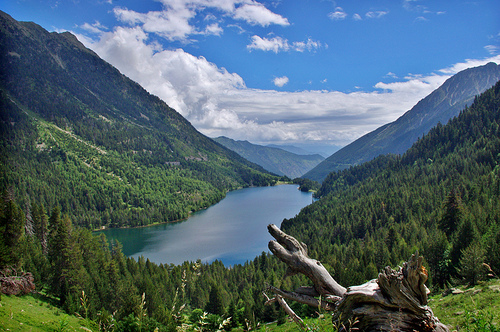 El Pais recommends visiting San Mauricio, the most famous lake in the Pyrenees and former glacier found at 1,910m. But throughout the park, you’ll find water in every guise including babbling brooks, streams, waterfalls, rivers, reservoirs, dams and huge glacial lakes. Lakes cover 15 percent of this park’s 102 sq km surface – and the reflections of the mountains and forests on the water make for perfection. There are many access points into the park and walking routes inside. If mobility is an issue for anybody in your party, the park can also provide a driver (in a 4-wheel drive) to move around within the park from Espot. The cable-car at Vall Fosca also affords excellent views. The highest peak in the park is Comaloforno measuring 3,033m – although Els Encantats, the two peaks that rise to 2,747 m in front of San Mauricio Lake are better known. The Guardian recommends the park for hikers of all ages – from easy family strolls to testing multi-day treks into the mountains and suggests cross-country skiing in winter. The National Geographic says that while winters are cold and snowy; it’s possible to explore some of the territory by snowshoe. Winter can linger well into Spring and some mountain passes are snow-covered in June so bring layers and check the routes that are safe to traverse with the park authorities. The 339 sq km that makes up the Sierra de Guadarrama is Spain’s newest national park on the mainland (since 2013) and is a lifesaver during the Summer when city residents from Madrid and Segovia seek the cooler temperatures amongst its high-mountain wetlands, lakes and rivers, pine and oak forests and waterfalls. 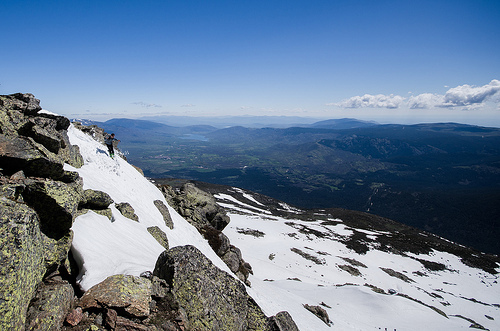 If you enjoy rock formations, you’ll want to seek out the granitic landform at La Pedriza, the Seven peaks and the glacier geomorphology at the Peñalara Massif which is the park’s highest peak and reaches 2,428m. Perfect for hiking, biking and rock climbing and in Winter, you can snowboard, cross-country ski, try out Nordic skiing, or bring or hire some snow-shoes or a sled! Wildlife includes wolves, golden eagles and black storks. You’ll also find many herds of cattle and sheep that use the traditional transhumant routes. Click here if you’d like to read more about Madrid. Cabañeros National Park takes its name from the conically-shaped huts used traditionally by shepherds and charcoal burners as a temporary shelter for their work in the field. The inhabitants of the Montes de Toledo were actively involved in cork extraction, agriculture and beekeeping. Today, you can explore the 408 sq kms via the 16 walking routes (or drive in a four wheel drive) that afford you views of the oak forests, peatlands and grasslands. 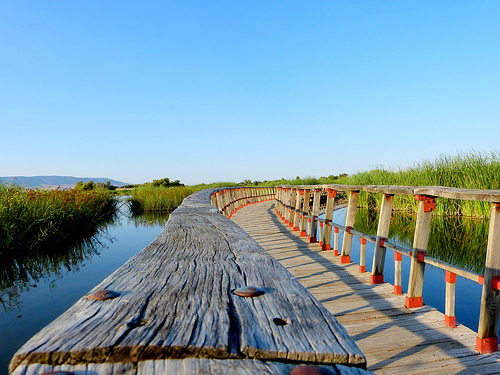 Two of these routes can also be undertaken on bike or horseback. As you explore the parkland, you’ll come across birds such as the imperial eagle, the black and the griffon vulture, both black and white storks, the common kestrel, the snake eagle, the booted eagle and the Eurasian sparrowhawk. Reptiles include the newt, European pond turtle and green and black lizard. Mammals include the deer and wild boar, roe deers, beech martens, common genets and foxes and wildcats. There is a stork observatory inside the park. You’ll find it hard to believe that the State purchased this land for firing practice in 1987. Following local protests, it was converted to parkland and became a national park in 1995. Although it’s not somewhere that is associated with mountain ascents, its highest peak, Rocigalgo, at 1,448m, still surpasses the UK’s highest peak, Ben Nevis. Click here if you’d like to read more about Castilla la Mancha. Dating from 1973, Spain’s smallest national park is just 30 square km in size. It’s the last water table on the central plain of the peninsula, formed by floods from the River Guadiana and the River Cigüela. Practically unique in Europe, these wetlands are strategically situated on the migration routes of many birds, which stop over to rest and even to spend the winter. You may be able to spot the great crested grebe, the little grebe and the black-necked grebe, as well as the heron, cattle egret, night heron, and all kinds of Iberian Anatidae. It’s home to quite a few reptiles too including the grass snake and the water snake. You won’t be surprised to know that the mammals that live here are usually the ones that like living near water such as the otter. You’ll also spot rabbits, hares, foxes, weasels and the European polecat. Given the wet terrain, waterproof footwear is important here and you might want to consider taking a four-wheel drive tour of the park – which begins with a two hour hike so there’s no need to feel like it’s being handed to you on a silver spoon. Stay at the nearby Parador de Almagro where you can dry off and recover in style from the day’s trekking. This park used to be known as the Sierra del Sol in the middle ages. Stretching south from Granada to the gorgeous valleys of the Alpujarras, this 862 square km space was awarded national park status in 1999. 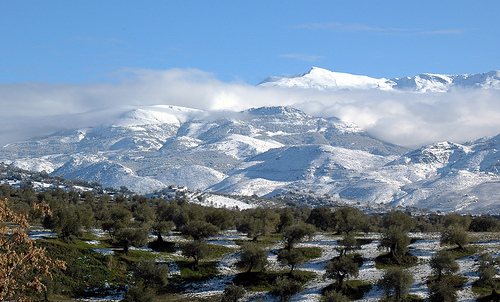 It’s highest peak, Mulhacén, is 3,482m-high but you’ll find 14 other peaks above 3,000 metres. With so much expanse and empty of civilisation, it makes the perfect contrast to a few day’s sightseeing of the Alhambra and the Albaicin neighbourhood in Granada. The Guardian says “the hiking is spectacular; just pick your altitude to suit the time of year. There’s skiing from late November until late April.” El Pais highlights the 2,000 species of flora, 66 of which are indigenous to the area. We never cease to be amazed by the irrigation systems that date back to the time of Moorish rule. Depending on the time of year, you can ski, hike, cycle or even join a week-long horseback trail through the park. Wildlife includes the wild boar, martens, badgers and wildcats. Native bird species include the golden eagle, Bonelli’s eagle, the common kestrel, the little Owl, the Eurasian eagle-owl, the European goldfinch, the serin, the Ortolan, the Dartford warbler, the wheateater, the red-legged partridge and the common quail. To learn more about Andalusia, click here. Doñana became a national park back in 1969 and its 542 square kms is made up of marshlands, lagoons, woodlands and sand dunes. El Pais highlights its spectacular cliffs and a complex of lakes that offers thousands of birds shelter while the National Geographic says it’s one of the few large European estuaries that is unmarred by development or agriculture, adding that half of Europe’s bird species can be spotted here at one time or another. 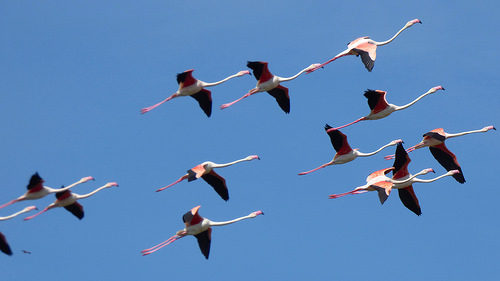 More than half a million birds spent their winters in the park each year and we are very partial to a few days exploring the 38 km of pristine beaches and going inland to enjoy the flamingos and to catch a sighting of the Iberian lynx, the imperial eagle, the marble teal and the white-headed duck. 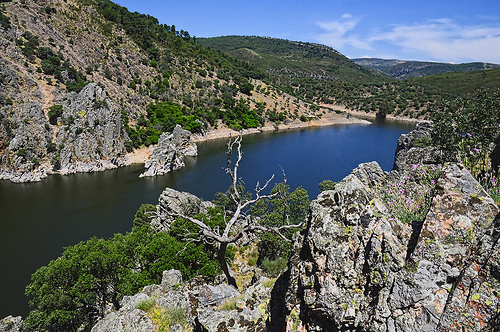 Part of the national parks of Spain since 2007, Monfragüe translates as ‘fragmented mountain’ which is perfectly apt as this 183 km squared area of parkland is divided in two by the River Tagus. The Guardian recommends enjoying the scenery provided by the water carving through dramatic cliffs and suggests seeking out the ruin of Castillo de Monfragüe. El Pais calls it a paradise for birdwatchers and we agree. The park’s featured friends include black storks, imperial eagles, and Egyptian vultures plus another 190 species of bird. And that’s not all – you’ll find 48 types of mammal including otters, wild boar, foxes and deer, 20 types of reptile, 12 amphibians, and 10 types of fish! If geological rock formations and cave art are of interest, you’ll be kept happy too. The highest peak in the park is the 836m high Miravete but you’re probably going to take more photos of the impressive Salto del Gitano – a 300m cliff that rears up above the Tagus. 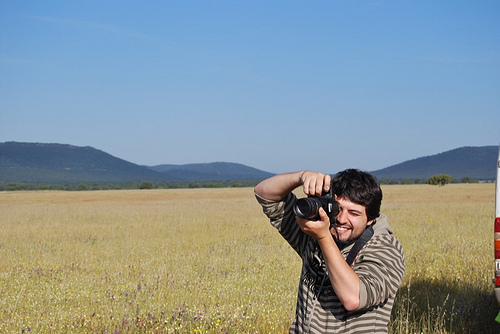 To read our guide on Extremadura, click here. 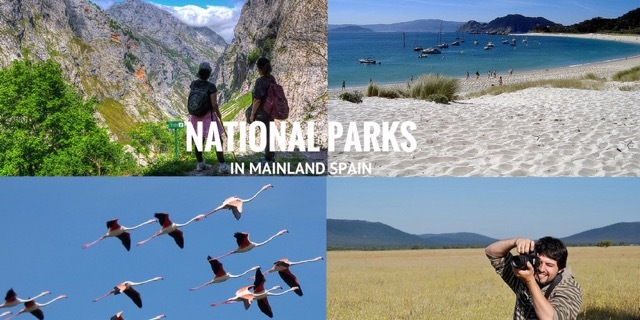 Although this guide refers to mainland Spain, we’ve made an exception for these four archipelagos in the Atlantic Ocean that were given national park status back in 2002. 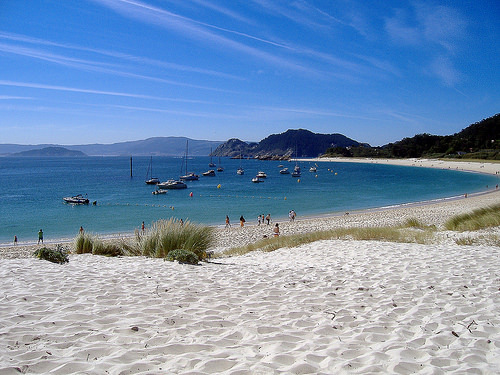 The Cies Islands which are easily accessible from the mainland (with passenger ferries from Vigo, Cangas and Baiona) are the best known and the most popular (especially during the Summer months) so if you want somewhere quieter and have access to a boat, carry on to Ons, Cortegada or Sálvora. Whichever islands you visit, you’ll find areas reserved as breeding grounds for sea birds and you may also be lucky enough to see the finback whale which has been sighted in this area. The islands (which measure 83 sq km in total) kept a relatively low profile until the year 2007 when Rodas Beach on Cies Island was named best beach in the world by the Guardian. Today there is a strict control on the numbers travelling by passenger ferry to Cies and Ons with a maximum of 2,200 visitors and 1,200 respectively set per day. We can see why it’s so popular – you really get a sense of being a Caribbean castaway – the colours on the islands and the surrounding see are astonishing. Dunes, cliffs and beaches provide diverse habitats that nurture all forms of life, from 200 species of seaweed to desert plants, and a variety of fish and sea birds not to mention the seabed which El Pais says harbours ecological treasures guarded by ancient shipwrecks. To read about our trip to Galicia visiting wineries, palaces and the Cies Islands, click here. Posted in Active breaks, Getting Around, National Parks, Useful Information and tagged Aiguestortes, Cabañeros, Doñana, Islas Atlánticas de Galicia, Monfragüe, Ordesa y Monte Perdido, Picos de Europa, Sierra de Guadarrama, Sierra Nevada, Tablas de Daimiel.